GODSMACK exploded onto the album charts with their latest release, WHEN LEGENDS RISE, the band’s seventh studio album and their first in four years, available now via BMG. The 11-song collection, fueled by the #1 Mainstream Rock Song and video “Bulletproof” plus the title track “When Legends Rise,” entered the Billboard Top 200 album chart in the top ten (#8), with four #1 placements on other charts: Top Rock Albums, Top Hard Music Albums, Top Independent Albums and Top Alternative Albums. Purchase or stream WHEN LEGENDS RISE here. Loudwire hailed, “The band is painting with a broader palette and delivering one of their most well-rounded albums to date” with Billboard adding, “When Legends Rise is not only the opening and title track for Godsmack’s seventh studio album, but also the band’s statement of purpose.” Louder (U.K.) noted, “When Legends Rise exposes a band who are not afraid to develop and show how experience has colored their style” and AllMusic summed it up saying, “Legends presents a little of the old Godsmack–crunch, grit, and all–with an added dose of polish and melody.” GODSMACK—Sully Erna [vocals, guitar], Tony Rombola [guitar], Robbie Merrill [bass], and Shannon Larkin [drums]–recently released the official music video for “Bulletproof.” Directed by filmmaker Troy Smith, the song’s video is a short film that parodies the making of a rock video with cameos from Billy Ray Cyrus and Sebastian Bach. Erna ultimately hires his crazy Italian cousin to direct the video and everything goes wrong. Click here to watch. In addition, “When Legends Rise” served as a theme song for WWE’s “Greatest Royal Rumble” event, which streamed live April 27 on the WWE Network. On the live front, the band is currently headlining various U.S. rock festivals, receiving rave reviews from the fans and critics alike, with The Rock Revival declaring, “Godsmack is back with a vengeance, and their explosive live show left nobody disappointed” of their Fort Rock Festival set (Johnnie Crow, 5/4/18). 20 years after the release of their debut album and 20 million album sales later, GODSMACK are an even stronger animal than before. SHINEDOWN are at the top of their game and the charts with their critically acclaimed sixth studio album ATTENTION ATTENTION, out now on Atlantic Records. Click here to listen to the LP, which is being called their best work yet. The album simultaneously hit #1 on Billboard’s Alternative, Top Rock and Hard Rock Albums Charts and debuted Top 5 on the Billboard 200 and #1 on iTunes. Lead single “DEVIL” recently returned to #1 at Active Rock, the 13th #1 for the band at the format, racking up more than 7 million streams worldwide and immediately landing on the Spotify Global Viral 50 Chart. 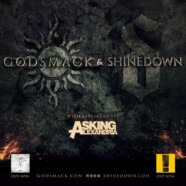 “DEVIL” continues SHINEDOWN’s unparalleled streak: every single released throughout the band’s career has hit Top 10 on the rock charts – a feat unmatched by any other band. The soaring and anthemic “THE HUMAN RADIO” was featured on Spotify’s New Music Friday. Both videos have a combined 10+ million Youtube views. SHINEDOWN‘s renewed intensity and uplifting spirit are front and center on ATTENTION ATTENTION, an album that showcases the band’s heart and depth like never before on songs like “GET UP,” an encouraging anthem that frontman Brent Smith wrote about watching bassist Eric Bass struggle with depression. The powerful song has immediately resonated with fans racking up more than 3 million combined streams and counting. Click here to read the band’s op-ed about mental health with GRAMMY.com. Their most personal album to date, ATTENTION ATTENTION is a psychological journey that follows an individual from life’s lowest lows to the highest highs as anxieties dissipate and demons disappear. The story that unfolds as the album progresses is a poignant and enduring statement about humanity and our will to overcome struggles and thrive, touching on topics such as mental health, facing fears, not being afraid to fail, social media negativity and the resolve of the human spirit. Billboard praised “the pounding, riff-driven attack of ‘DEVIL’…to a rafters-reaching major-key hook on ‘BRILLIANT’…Shinedown is on the cusp of adding to its legend…” while Alternative Press proclaimed that “Shinedown’s well-honed craft hits a new level.” Guitar World called the album “…powerful…ominous…infectious… “and Substream says it’s “…a fantastic audio voyage that possesses the power to soothe emotional wounds and ignite a fiery passion for change in the gut of anyone willing to listen……their most important album to date…” Given the deeply personal nature of the record, SHINEDOWN went in-house for production for the first time ever, enlisting bassist Eric Bass to produce and mix the album in its entirety. With a symphony of thought-provoking lyrics, stadium-size, explosive guitars, unpredictable rhythms, and cinematic flourishes, ATTENTION ATTENTION ushers in the band’s biggest and boldest chapter yet. Deluxe album bundles are available at the official SHINEDOWN webstore HERE.